Hello everyone! I'm in the process of developing a 2D puzzle adventure parody game using the Solarus Engine. It's called Vegan on a Desert Island. The game is licensed under GPL-3.0 and CC-BY-SA-4.0. 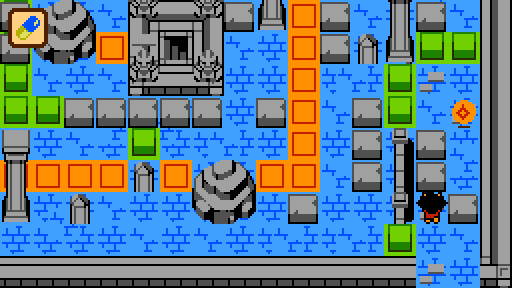 It uses Zoria Tileset for many of the background tiles, and many are custom made by me. The source repo is on GitLab. Feel free to use my sprites, music, characters, etc for anything you want! I plan to upload it all to OpenGameArt.org once the game is complete. It's about 10% finished now. I've seen this somewhere else before too! Good job, looks like it's coming together technically, and all the parts seem cohesive. I couldn't tell from the video what the central ideas of the parody were- what's your like, elevator pitch? Often when having conversations about veganism, people will raise hypothetical points and keep raising the goalpost as a way to defend their choice to not be vegan. It's a really common trope for these conversations to end up at some version of "well, would you stay vegan if you were stranded on a desert island?" Don't get me wrong, I think it's extremely important to debate things at the hypothetical level, but this question is so predictable that vegans can't help but laugh and say "yeah, as if I haven't heard that one before." The game's story is inspired by The Real Castaway, a 2001 mini-documentary where a woman named Rachel survived for 9 months on a desert island eating exclusively coconuts. 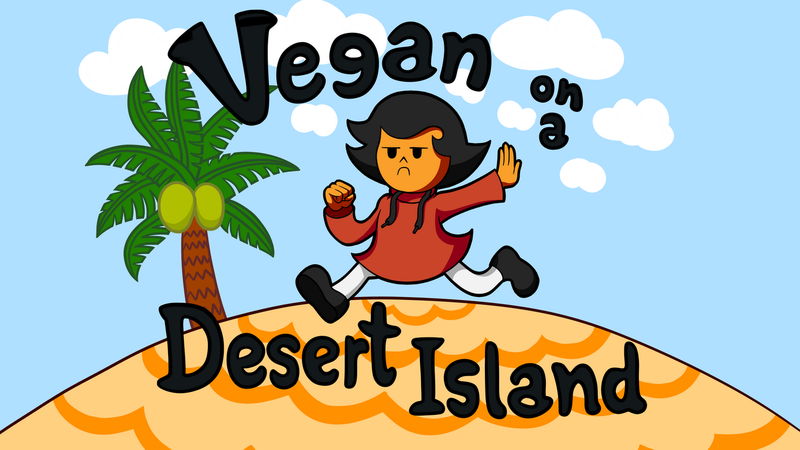 This game takes that trope to the extreme, placing the character as an actual vegan on a desert island, and is meant to convey that, not only can you do it, you will be totally fine! (slight sarcasm) In fact, since you're vegan, the animals will actually befriend you (since you are so benevolent /s) and help you out. I'm making fun of nonvegans, I'm making fun of vegans, really I'm making fun of culture. The actual storyline involves real issues that animals face, such as pollution, predation, and systems of speciesism. 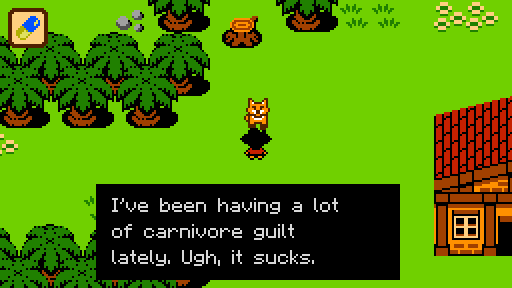 Different areas of the game focus on different real animal themes, but they are expressed through humor. A full outline of the story is also available, if anyone is interested. Thanks for your kind words. I'm looking forward to others playing it. So, just an FYI, you trailer is ambiguous enough that I had noooo idea if this would be the kind of thoughful satire it seems like you're trying to do, or if it was just making fun of anyone who was trying to be thoughtful or less than selfish. I think it's a slight ambiguousness in what dialog you chose to show, or the way "parody" often, unfortunately, means "making fun of someone's sincere beliefs". Or maybe the internet has just primed me to except the most dis-empathetic qualities from people, lol. This is awesome! I love charming retro games like this. I can't wait to play this. Cool! A new game that uses Solarus! So, just an FYI, you trailer is ambiguous enough that I had noooo idea if this would be the kind of thoughful satire it seems like you're trying to do, or if it was just making fun of anyone who was trying to be thoughtful or less than selfish. Thank you for the feedback! I agree with you. When the game is closer to being finished I'll create a new trailer and try to make this more clear. Thanks Diarandor and Neovyse for your kind words. Have you played Survival Kids from the gbc? (Gameplay here: https://www.youtube.com/watch?v=eQet3NwtHO4) I played it a little bit and I believe this game might have taken some inspiration from there too, or at least it has some things in common. I never finished it because it was too hard for a casual player like me, though. If you haven't played it, I recommend you to take it a look at it for inspiration and good ideas in your game. Hey, thanks for this!! Incidentally I recognize those palm tree sprites, which I stumbled upon looking for art inspiration, but I never looked into the actual game. I will definitely give it a shot and see if there's anything I can glean from it. I played Survival Kids for a few hours last night. It really is super similar to what I'm going for! I was surprised. The way you can collect, use, and combine items was really illuminating. I think this will help me make some decisions about that. Thanks again. I agree that it's too hard, though. I prefer to enjoy the game I'm playing instead of feeling like I'm constantly fighting for my life, haha. We're now on the Solarus Discord at #voadi. I post daily updates about my progress, so feel free to follow along! You can also join via Matrix at #voadi:matrix.org.